G1 Adventure Tours and Bayside Adventure Sports invites you to join us on our journey to Peru! Trek the ancient 27 mile Inca Trail to the historic 15th Century majestic Machu Picchu. Known in Quechua as the Qhapaq Ñan, the Inca Trail was once reserved for elites walking the sacred pilgrimage route to Machu Picchu. Today, the Inca Trail remains an exclusive affair, with entrances limited to 500 people per day. Our custom trip combines pre-trip training, opportunity to meet and hike with trip participants, packing help, travel agent assisted flight booking, a complete itinerary filled with a day of serving at a local mission project. We have unique options such as mountain biking, cooking classes, dirt bike trail riding with MotoMission Peru leader Scott Englund, and guided visits of the most important historic sites around Cusco, Peru. On the 27 mile Inca Trail we have extra porters that make it possible for you to carry just a daypack with daily water, snacks, camera, and extra clothing. Our professional team guides and porters treat us to amenities only usually a part of more expensive tours. Yes, we have learned through our past trips to Peru how to make this the best trip possible! Want To Go To Peru And Machu Picchu But Can’t Do The Hike? We are offering a second opportunity to see Machu Picchu. We know that many have physical limitations that make it impossible to endure the 27 mile hike, so we are putting together details that would have these people stay at our hotel in Cusco two more nights (while the hiking group is on the trail then take the train to Aquas Caliente to get a room at the same hotel our whole group will be in after they come down from Machu Picchu. 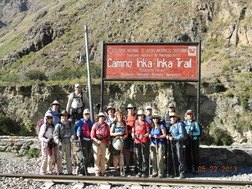 This group will take the train, enjoy dinner in Aguas Caliente, get to bed early, then catch the first bus going from town up to Machu Picchu to meet the hiking group there (we use radios to find one another). This group will join in the tour of Machu Picchu as well as have the option of climbing Huayna Picchu if desired (see below). Price for the group that does not hike will be very close to the same price (TBD) because of the extra hotel nights, extra train ride, and extra night at the hotel in Aguas Caliente. If you think this option is for you, please contact Greg Weisman ASAP as we will want to make sure we have people in Double Occupancy lodging and no one traveling alone. We will have pricing and registration for this option soon! 1st payment, $1000 deposit. Deposit deadline Sept 25. 2nd payment, $675 due by September 25, 2018. 3rd payment, $675 due by January 15, 2019. Final payment, $599 due by March 1, 2019. AIRFARE – Airfare is not covered. Generally, the earlier the airfare is purchased, the lower the price. We will be flying in and out of Sacramento to make our departure and return as convenient as possible. In the past, round trip airfare has cost about $1,200. *We are getting word that the Inca Trail Permit fees will be increasing by $250-$300 each. We may need to adjust our trip fees to accommodate any unanticipated increases. We will update as we find out more (current as of 9/13/18). ​See the schedule below to see how we acclimate for our adventure by spending a few days touring the former Inca imperial heartland around Cusco and the Sacred Valley as well as a day of serving missionaries who are friends of G1AT/BAS. Our porters will carry 15 lbs of your personal gear as well as our tents, eating tent, food, tables and chairs to sit at during meals, and extra sleeping pads. Each day as we arrive at our camp our tents will already be set up (double occupancy) and our duffle bags of personal gear ready for us to access for the evening. Each morning we will be greeted with hot tea or coffee at our tents and, after we are packed up, we enjoy a hot breakfast as our porters pack up our tents an duffle bags to get on the trail to be ready for us when we arrive that night. What will we eat along the trail? This is one of the best parts of the experience as our trail chefs prepare fresh meals for breakfast, lunch and dinner! We eat in our own private tent on chairs at tables by candlelight and sometimes our own Head-lamps. You will not go hungry! Delicious meals give our team wonderful opportunities to relax and enjoy one another. One of the challenges we westerners face on this trek, though, are the bathroom facilities. Yep, this is a third world country and squat toilets are the rule out on the trail. They are not clean, they are not enjoyable, they are actually downright disgusting, to be honest. For this year’s trek we are going to, for the first time, relieve our team from this part of the “adventure” by having our porters bring along a separate, private to just our group, latrine tent and travel potty for at our 3 campsites. We’ll still have to use the bathrooms along the trail during the hike, but at least we will be able to avoid the worst ones on the trail at the campsites. This is a special, custom part of our trip you will not find with almost any other tour group. Inca Permits are non-refundable, non-transferable and require absolute accuracy for reservations. This is one of the unique aspects of the Inca Trail. To protect the trail and to keep tour groups from being able to reserve and re-sell (translate “scalp”) Inca Trail permits, the Peruvian Government requires names and passport information and reservation fees to reserve a spot on the trail. Once that permit is purchased, it cannot be refunded or even transferred to another person. There are only 500 people allowed to hike the trail each day and those 500 include all guides, porters and tourists. If a person purchases a permit and can’t use it, there are just 499 people on the trail that day. These permits are all purchased at one time on the first day that the Peruvian Government decides to sell the 2019 permits. (2018 permits went on sale in October 2017.) We MUST have every person’s accurate Passport information and money in order to get permits for our group. Due to this policy, deposits are non-refundable after July 31 but can be transferred to another person up until September 15. May is the most sought after and most competitive month to get Inca Permits! Why, then, do we do this trip in May? Simple. Because May is the best month for the Inca Trail. The rainy season in Peru generally ends in April. The crazy tourist season when the city of Cusco and the Sacred Valley quadruples in size begins in June and runs through the summer months. This is because the Incas worshipped the Sun and the Summer months are filled with festivals, religious celebrations, and inflated prices. We choose to go in between the rainy season and the high season. Could we get rain? Absolutely! We have had some rain every trip. But we have also had wonderful weather on the trails for 80-90% of all three past trips. NOTE: Only 500 people are allowed to hike the Inka Trail each day. This is the total number, including tourists, guides, and porters. This is to protect both the Inca Trail and the sanctuary of Machu Picchu. Stipulations are very strict as well – your identification must be perfect, matching a valid Passport with your permit for both the Inca Trail and entrance to Machu Picchu. Once a permit has been purchased (about $550), there can be no changes, transfers, or refunds. Because of this, we ask for a non-refundable deposit payment for our trip. We will begin at an elevation of 8,438’ and hike 7.5 miles gaining altitude to stay at our first site, Huayllabamba at an altitude of 9,843’. This is a great warm-up day helping us to acclimatize to the altitude and get our hiking legs ready for the most challenging day, day #2. Inca Trail: We begin our day with a hike uphill for four miles, through the morning, to summit Dead Woman’s Pass at 13,796’. This is our highest point of the trek and always brings a celebration photo. We then give our knees a crazy workout dropping down Inca stone steps 2,000’ of elevation in just 1.5 miles to stay at Pacaymayo, 11,788’ elevation. Another very long day as we climb back up 1,200’ in about a mile to Abra De Runkuraqay (out second highest peak) at 12,960’. We continue another 7.5 miles with generally downhill slopes to get to Winaywayna, home to one of the most beautiful of all Inca sites, for our 3rd night on the trail at about 8,600’. We start out super early as we wake about 3:30am to get into line to wait for the gait on the Inca Trail to open and allow us and the other 350 or so people on the Inca Trail to hike the remaining 4 miles to enter Machu Picchu (7,982’) at the famous Intipunku (Sun Gate) to capture the famous sunrise photos of Machu Picchu (if there are not clouds covering it like they did 2 of our last 3 years… which cleared by mid morning). We take sunrise photos from Inipunko then decend to Machu Picchu to begin a tour of this most famous site in all of South America. You will have options on this day as some will not just want a full tour of Machu Picchu but will want to climb either Huayna Picchu or Machu Picchu Mountain (see below under “Other Options”). Whatever you choose, our guide will help us to experience Machu Picchu to the full before catching a bus ride (ticket is included in our price) down to the ancient city of Aquas Caliente where we will stay the night in a comfortable hotel so that we can really enjoy this very special location before taking the morning train the next day back to Cusco. Warning – this trail must be done on the same day we are at Machu Picchu. For those that been up since 3:30am that morning to complete the trek to Machu Picchu, this makes for a super exhausting day… but one you will never forget! Huayna Picchu is the triangular shaped mountain always seen in the postcard photos of Machu Picchu. There is a separate permit that sells out early for one of the two slots available for hiking the steep and challenging trail to the summit. There are only two times for people to climb Huayna Picchu, start times for the 2-3 hour hike are between 7-8am (200 spaces available) and 10-11am (200 spaces available). We choose the 10-11am start so that we have time to have a great tour of Machu Picchu before beginning the climb. Those who don’t choose to do the climb will stay with our guide who will spend more time completing a tour of Machu Picchu. Those who do Huayna Picchu will be guided by Greg Weisman who will complete the guiding of the rest of Machu Picchu after the climb (yeah, not as good as the professional Peruvian Guide, but after having been there 3 times, he isn’t all that bad!) Cost for this extra Permit is $75 and must be decided on and paid for by September 25, 2018 since these permits must be paid for at the same time as our Inca Trail Permits.